We arrived back in Skopje after that early bus ride from Prizren, and while we had to check out of our Airbnb apartment that morning, we were exhausted and in need of a shower. We slept for a couple hours and left around noon. Our host was out of town and didn't live in the space, so I'm pretty sure no one else was checking in after us. I'd heard that the city isn't that great and to not spend too much time there. I was glad for that advice. It's pretty meh and Macedonia is full of amazing nature and smaller villages. The great 2014 renovation project of Skopje has spent millions of dollars (that the country doesn't have) and it's divided people. They protest with colorful paint bombs, which is kinda cool. It's usually cleaned off soon after, so I didn't see as much around the country as I'd hoped. Swedish Matt gave me a couple recommendations for the city, so we headed out to a restaurant for lunch before a quick walk around town. So the interior was cool and it wasn't too crowded, but try having your lunch with a side of cigarette smoke. Ugh. That's the one downside of Balkan travel. Everything else is great. Few crowds and low prices. I ordered the Old House Pot and it was delicious. After lunch we headed to the old part of the city. We went into the Mustafa Pasha Mosque, originally from 1492. And now towards the modern town. This sums up Skopje pretty well. The stone bridge is a symbol of Skopje from the 15th century. This is Mother Teresa's Memorial House (not her actual house) - she was born in Skopje. We were done with Skopje at this point, so we hopped in the car and headed to Ohrid, where we'd spend a couple nights. 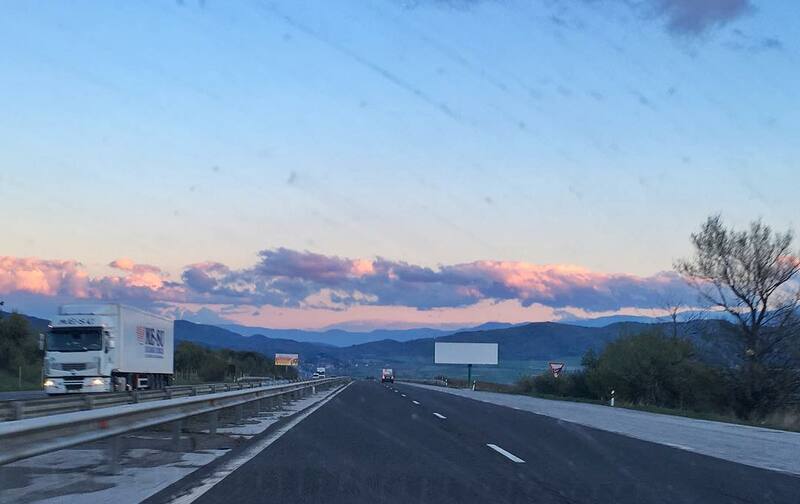 We just missed the Easter weekend rush when everyone was in Ohrid and there was no traffic in Skopje as we left. I tried to snap some photos of caves for Anthony during the drive. We drove through Mavrovo National Park on the way - wish we'd had time to stop to see the church in the lake - and the weather was foggy, and it was snowing at the top of the mountains. Not the most relaxing drive. We got into Ohrid and our hotel was located at the top of the hill, through some tiny, steep stone streets. The most tense driving we had, and it was confusing to navigate and Anthony was frustrated driving. But we made it! When the roads split into 7 ways, it's hard to tell which way to go. And once you go down one, there's no room to turn around and go back if it's the wrong one. We found our hotel ($20 a night and great view) with the nicest owners. They helped us park the car in a secure lot and get oriented to the city's winding roads and staircase shortcuts. TripAdvisor said pizza's good in this town. It's okay pizza. Guess which pizza he ordered. Night walk around the lake and to a pier. It was cold and windy. Better weather on Tuesday morning! Heading out to see all the churches. Ohrid is a UNESCO site for both culture and nature. The lake is one of the oldest in the world, and it's huge. Apparently at one point there were 365 churches in the city walls. Not as many today, but still plenty. First stop at St Sofia, from the 11th century. It was turned into a mosque in 1466 and the frescoes were whitewashed. You can see some restored now. Lots of offers for 5 euro boat rides. We didn't take one. Guess I'll have to go back. This is Sv Jovan Kaneo, and it's likely the most photographed and visited in Skopje. Inside wasn't that great - just enjoy the outdoor views if you go. Anthony had been planning to swim in the lake for weeks, so we headed down a path to the shore. Ready. It was freezing and he did it. Video on my Instagram. A bunch of German kids came down and set up camp next to us, excited to swim. They took off into the water and were surprised at how cold it is. Eeeeek. I don't feel like I missed out by not getting in. We walked down the lake shore to the other side of town and found this and some lunch (once again in a smoky room). We headed up the hill again to the fortress, which dates from the 10th century. At one point the city was completely enclosed in the fortress walls. Got all the way to the top and the fortress had just closed. Boo. We had some good views though. Now we get into my favorite part of Ohrid. We saw a lot of construction and went towards it anyway - paid a small fee at a booth and walked into these grounds to St Kliment at Plaosnik. St Kliment is a Byzantine cathedral from the 9th century that's been converted to a mosque a couple times and been rebuilt a few times as well. It's a beautiful space. Plaosnik is the architectural area that's currently under excavation, and wow is this stuff old! I was enthralled and really wished I'd had a guide around to tell me more. But there was no one around really at all. The basilica is said to be from the 9th century and dedicated to the Apostle Paul, who came 'round these parts. Other pieces of the mosaic floors date back between the 4th and 6th centuries. Amazing. There was also a university here ages ago. Lots of work still to do around this complex - it'll be interesting to see what happens. Ohrid is also reaching max tourist capacity and it's status could start to go downhill with overcrowding. Time to move along and walk home again. We walked through the town on the way to dinner and found these friends. This tree is 1000 years old. Not sure who's been counting. Wednesday morning we set out on a drive through other parts of the region. The weather wasn't awesome, and I was pretty nervous driving steep, curvy, wet mountain roads. Sometimes the fog was so thick we couldn't see. But we made it out alive. We first drove through National Park Galicica, up a mountain. Probably passed two other cars over the course of two hours. Our little Bulgarian rental car that smelled like horrible stale smoke. Ugh. Fresh cigarette smell would've been much better. We made it over the mountain to the village of Stenje, right near the Albanian border. Home to Lake Prespa, which is gigantic. It borders Macedonia, Albania and Greece. We found one little restaurant open, so we went in and tried our luck pointing at things on the menu. I scored with my dish - chicken wrapped in bacon with some cheese in the middle. Anthony ate some weird fish thing and it was good for a couple bites and then gross. Then we took off towards Bitola, which is a great cultural city with remains from the Ottoman Empire. Just outside Bitola is Pelister National Park, so we drove a little ways into it and did a short hike. By the way, there are no entrance gates or fees collected, at least none that I saw. Enjoy for free! Animal traffic jam on the way down the mountain. After the crappy weather in the morning, this was a lovely sight. Bitola has a couple cool cemeteries - first we visited the Jewish one, then the Ottoman one. A little ways out of town are the WWI German and French military ones. The gates were already closed this late in the day, so we could only look from afar. Now to the Ottoman cemetery, which isn't marked. It's just on the hills behind a gas station. We headed into town for a quick walk before the sun went down. Driving back to Ohrid we found another war memorial. A bit more scary driving in the dark to Ohrid, but we got there. Late night pizza shop was open for some good ole shopska salad and better pizza than we'd had before. Thursday morning - time to drive back to Bulgaria. We had eight or nine hours ahead of us. Take us back to Kosovo! Another random roadside meal in Kriva Palanka, definitely the only foreigners who'd been through in awhile. Had to use up all our Macedonian denars. Long day of driving, almost to Plovdiv!